Every product and service has a life cycle. The length of this cycle depends on the product or service in question – and in marketing terms, it pays to extend it as much as possible, to maximise profit. 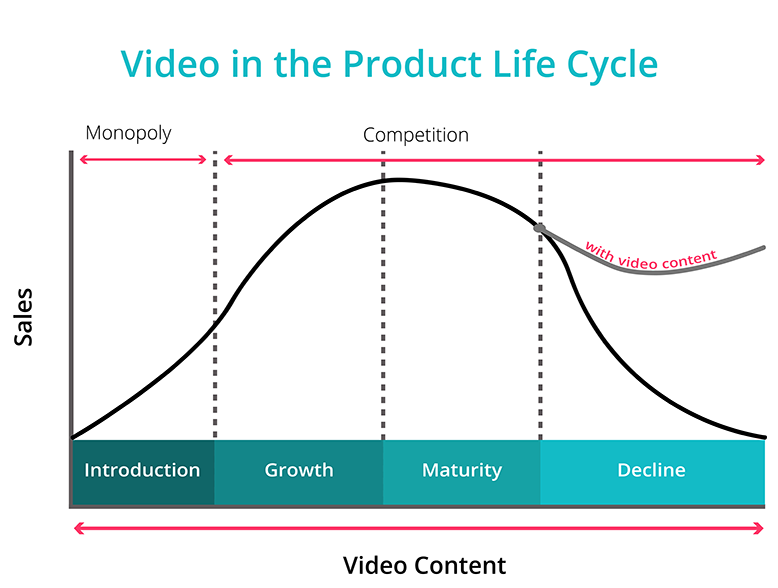 Here’s some information about the product life cycle, and how video content can enhance the saleability of your products and services. The research,development and launch of the product. Your main objective is to build brand awareness, as well as develop a market for your product. Sales and market share are increasing. You now focus on building brand preference as awareness has been established. Sales reach their highest levels, but growth is slowing – due to competition or market saturation. You will want to focus on defending your marketing share while maximising profit. Sales start to fall. Options to boost sales again include: developing the existing product to extend life cycle, reducing costs for loyal customers, or discontinuing the product entirely. Video is one of the most versatile forms of marketing, which makes it ideally suited to extending the life cycle of your products and services. Here’s a few ways in which video content can be repurposed to enhance customer experience and generate more sales – for longer. At this point, your target market is at the very beginning of their purchase journey and has little or no awareness of your product. Marketing expenditure will be high, and initial revenue will be low. Marketing efforts are high-risk at this stage. Your product requires heavy promotion in order to gain interest. We recommend: Promo videos, explainers and corporate video. Cost effective: Video production is actually considered the type of content with the highest return on investment as it is easily repurposed. The great news is that it is entirely possible to commission a quality corporate or promotional video on a reasonable budget, and then reuse this content throughout your marketing strategy. That should help cut your marketing expenditure at this stage! Building awareness: Promo videos are easily shared on social media – and are valued as a source of entertainment and information. They can be made on a reasonable budget which is perfect when other marketing spend is high. Providing information: Explainer videos inform and educate your target market – detailing key features and benefits – great for providing answers to common customer queries or if you have a complicated product. Instant impact: 65% of people are visual learners. Video is a highly visual form of marketing that creates immediate impact and is recalled easily. Flexibility: Promos and corporate videos are great for appealing to both a B2B or B2C market. They are professional yet engaging and informative. Your target market is aware of your product, but competition is emerging. As a result, you need to stand out from the crowd. Marketing spend is still substantial. There’s pressure to maintain a ‘buzz’ about your product. Increased competition means greater need to differentiate yourself. We recommend: Product demos, Promo videos and corporate videos. Cost-effective: Reduce marketing spend by using your video content to achieve a range of marketing objectives – raising awareness, boosting sales and developing brand loyalty. Repurposing: Most video content can be repurposed. Use a product demo to highlight USPs, create a stronger brand image and stand out from the competition. Or continue to exploit your promo videos to create a buzz around you and your product. Persuasive: Product demos prove that your product is better than the competition – offering powerful visual evidence. Emphasise your product benefits whilst promoting. Authoritative: A corporate video creates credibility – giving your brand a powerful note of authority. This is the ultimate way to differentiate yourself and increase brand preference. 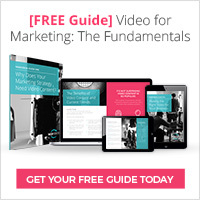 Increase understanding: Videos increase understanding of your product or service by 74%. Sales have peaked, but growth is slowing. Now, it’s more important than ever to create impact and reignite interest. We recommend: Testimonials, case studies, animated advertising videos. Boost conversions: Video has been proven to appeal more naturally to your audience – which boosts leads and conversions. On landing pages, they can increase conversion rates by 86%. Trustworthy recommendations: In a saturated market, case studies and testimonial videos are ideal for standing out from the competition. Peer reviews are often regarded as reliable as those from friends and family and are incredibly persuasive – perfect for defending your market share. Enter new markets to maintain profit: Case studies highlight your best work and attract new customers. They provide proof that your product solves their problem. Brand distinction: Advertising videos strongly promote your brand, and incite curiosity, helping you stand out from the competition. Adding animation to any video helps you to tailor your content to portray your product exactly how you want – so use it to show why you’re different! Sales are beginning to fall, and decisions need to be made regarding the future of your product. Demand falls, and so too do profits. Your customers expect something fresh. Other alternatives present themselves on the market. We recommend: Training videos, promo or sales videos, animated explainer videos. Build loyalty: An after-sales training video demonstrates your ongoing value. Repurposing: Repurpose both testimonial videos and promo videos to develop interest in further products. Animation and motion graphics add fresh visuals to existing video content. Reignite interest: A sales video re-engages your target audience and encourages purchasing. Video is highly effective at extending the life cycle of your products and services. It’s a visual, informative and often entertaining way of connecting directly with your target audience. Its ability to be repurposed means that it offers excellent value for money and helps to lower marketing costs at the beginning of the life cycle so you can enjoy better profit margins and return on investment. To discover more about creating video content for your business, get in contact with WebVideos, or download our FREE 4 part Guide to Video for Buisness today. This is a really nice read and couple of things are really interesting. I am into Digital Marketing profession as well as training. I personally do brand promotions with video marketing and also train our learners on the same. I completely agree that video is one of the best ways to convince & convert one visitor into a business lead or paying customer and I do this regularly. But still I found some of the things on this post which are really new (or at least I did not think in that way), loved reading this post. Thanks for your comment Sunidhi! Glad you found it interesting! Are there any bits in particular you would like to read more about? Would be great to get some ideas for future related articles! Video marketing is the best mean of generating leads for our products. Thank you! I hope you found it useful and will use this to your advantage in your own video marketing strategy! Great post. I believe video is the new method of communication. People seek video on anything rather that written content as videos are easy understandable without much effort. On the other hand it also enhances a product quality when it added to them. This strategy is in developing start and soon most marketers will be following this. Very informative article to read. keep posting such articles. Video is definitely game changer in terms of content marketing and we have seen for ourselves that using video in our startegy brings in higher quality leads, it’s much easier to informa and persuade visually rather than with written content – but a mix of both is best! Feel free to share this with anyone you think would find it useful and sign up to our monthly newsletter if you don’t want to miss our upcoming articles! I have bookmarked this page, I knew that video is somehow important to the page but didn’t knew how much it could affect the page and cycle, Nicely explained Article. Thank you! I’m glad you found it useful and you’re more than welcome to share it around to people who may also find it useful. Video is a real all-rounder in terms of its benefits to marketing strategy, but these benefits are enhanced when the content is properly aligned with your products life cycle and the customers journey… yet we get lots of leads ourselves who aren’t quite sure about the two! It’s more effective than people think! Thanks John! Sign up to our newsletter if you don’t want to miss anything, we post regularly! Your post is an amazing. The video’s also tells people something essential about its content: here’s a look at how this video will tell you. It is very good technique to increase brand awareness. Thanks for reading! Feel free to share this article with whoever you think would find it useful! Such an amazing detailed information. I have also started video marketing for my products and services, which come under web security. We help users buy ssl certificate to secure their website from cyber criminals. we are known as the best ssl certificate provider in India, and video marketing is helping us connect with more audiences. It works great. Merely wanna remark on few general things, The website layout is perfect, the subject matter is real great D.